The Trappists must compare fruitcake recipes. This fruitcake bears a very close resemblance to that of Gethsemani Farms. 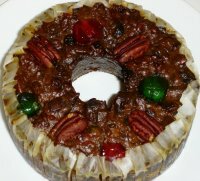 The two pound, four-ounce fruitcake cost $27.95 with shipping. Its looks are average, and the tin is also attractive but nothing too fancy. Ingredients include cherries, pineapple, walnuts, raisins, dates, pecans, papaya, orange and lemon peels for nuts and fruit, as well as honey, brandy and “Sherry Wine.” There are some partially hydrogenated oils towards the end of the list, as well as some standard preservatives. The cake itself smells of fruit. It is dense, with the batter serving to bind the ingredients together. One can definitely taste the alcohol, or perhaps I should say the memory of alcohol—the brandy and sherry make the taste of this cake more complex. In contrast to the Gethsemani cake, which uses red wine and whiskey, the brandy and sherry make the cake a bit sweeter. I also notice a more pronounced caramel, almost burnt flavor—perhaps the cake was a bit overcooked. My mother and sister, both aficionados of the Gethsemani fruitcake, tried this one as well. They felt that this cake looked “more homemade” than other fruitcakes and that the fruit in it is cut more finely than the Gethsemani cake. After multiple slices (ergh) we still found ourselves returning to the Gethsemani cake; the batter seemed a bit lighter and had better flavor. That being said, my Mom asked if I could get her a catalog for this abbey; she might send this instead of Gethsemani this Christmas for a change of pace. In conclusion, this cake is a nice find with a similar, complex flavor to the Gethsemani cake. I am intrigued by another product the Abbey offers called “Fraters.” They are slices of their fruitcake dipped in dark chocolate. I think it sounds delicious. My sister and Mom both think it sounds like stuffing a turkey with a chicken—just too much. I’ll have to try those when cooler weather sets in. 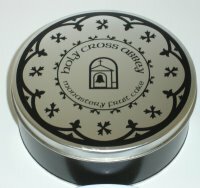 The Our Lady of Holy Cross Abbey also sells creamed honey and truffles, neither of which I've tried, so can't speak for them. Like your mother, I love Gethsemani's cake, but this year I'm in the mood for a change. So I'll try the Berryville Va. version, and let you know what I think. Gethsemani disappointed me last year with a cake that had hard bits of something or other in it. Also, I haven't thought the Bourbon had quite enough presence. Having initially grown up on the ubiquitous (in the South) fruitcakes, I found the Holy Cross Abbey fruitcake a nice switch. We've given a number of these as gifts over the years and friends have started looking forward to getting it. My girlfriend who is Methodist didn't quite get the humor in the fact that for years you could only order the fruitcake by mail or by fax but not by telephone. I had to explain the Trappist vow of silence to her. I did not like Holy Cross Abbey fruitcake AT ALL! I threw half of it away. The only reason I bought it instead of the other top reviewed cakes is because I WAS intrigued by the thought of the chocolate covered slices and that was because I've used a James Beard fruitcake recipe that had some chocolate in it that was fantastic. The chocolate on the slices was excellent but the slices of fruitcake were VERY DRY. I even send an email (right after sampling both the cake and chocolate covered slices to the Abbey) voicing my complaints and I never received a reply which really made me very angry! I love Monastery Fruitcake and get one for myself every year, plus send one to my sister, who always looks forward to it. It more than lives up to our expectations. The nice tin it comes in keeps it fresh and moist. I've tried many fruitcakes over the years and this is the best. Now, I know that the good monks of Holy Cross are not angels just yet, but ladies and gentlemen, this is one heavenly fruitcake. It's a delightfully moist, chewy cake made with a wide variety of candied fruit, raisins, and dates soaked in sherry, along with walnuts and pecans, all blended in honey-laced batter with a coating of brandy and honey, decorated with pecan halves and candied fruit. It comes as a traditional round 2-pound cake in a reusable tin (which will probably be soon empty).